Sara Bareilles and Cyndi Lauper have been able to inspire millions of people with their music once again. This time around, however, they did it together. Sara Bareilles, the beautiful voice behind the inspirational hit song “Brave” from 2013 recently joined forces with Cyndi Lauper, singer of the emotionally-stirring classic, “True Colors,” from 1986. These two ladies blended both of those songs (“Brave” and “True Colors”) together into one epic mash-up that is emotional all by itself. However, Sara and Cyndi were able to take these emotions to a much higher level by combining the beautiful lyrics of “Truly Brave” with a music video featuring a bunch of kids that are currently struggling with cancer. Hearing the new spin that Sara Bareilles puts on “Brave” as she blends it with Cyndi Lauper’s classic song “True Colors” will blow you away. It is sure to get stuck in your head almost immediately. You might even make it through hearing the entire song by itself without crying at all. Once you start to watch these kids dealing with cancer playing and painting with one another as they also sing the words to the song along with Cyndi Lauper and Sara Bareilles, the tears in your eyes seem to come out of nowhere. Even though Sara Bareilles and Cyndi Lauper are featured prominently along with these children in the music video, the credit for putting all of this together has to go to Hoda Kotb and the Today show. Thanks to the Shine a Light series hosted by the Today show, Sara Bareilles and Cyndi Lauper were able to help bring all of this together – especially with the number of parents that had to agree to their children being featured in the music video. However, thanks to the empowering message of the song and enjoyable experience, many of the parents agreed that being a part of the music video became a cherished memory for their children. One of the mothers even went as far as saying that the Sara Bareilles/Cyndi Lauper music video was a “highlight” of her daughter’s life. It does not matter if you are a fan of Sara Bareilles and Cyndi Lauper or not. The fact that they were able to create such a memorable song to pay tribute to the brave children around the world battling cancer at such a young age should speak volumes. 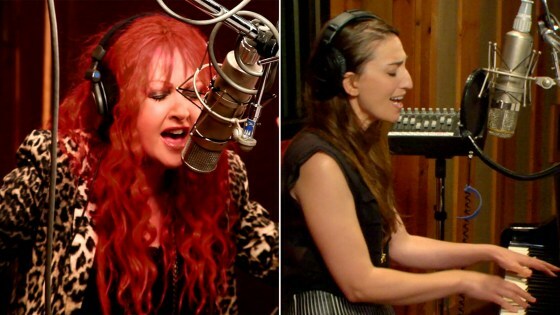 According to some of the responses and reactions that have been posted on Twitter, the Sara Bareilles and Cyndi Lauper “Truly Brave” mash-up video has already had a major impact on the minds and hearts of so many people. Just make sure that you keep a box of Kleenex nearby when you watch Sara Bareilles and Cyndi Lauper perform in this emotional yet inspirational video for the song “Truly Brave.” You are definitely going to need them.